With the Ecobee4 almost here, Amazon's offering the Ecobee3 at a deeper discount. 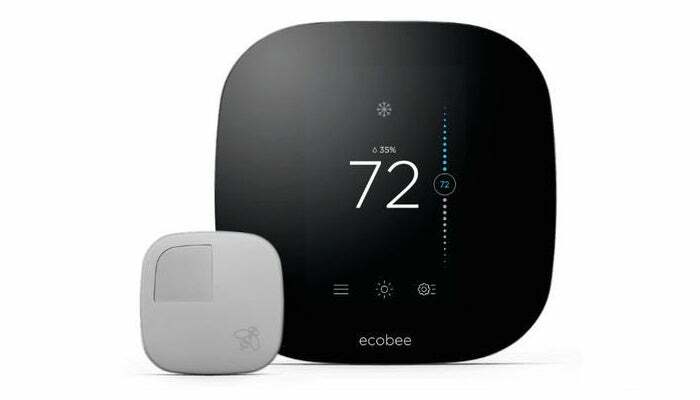 With the ship date of the Ecobee4 smart thermostat ten days away, the deals have been increasing on the current Ecobee3 model. Right now, Amazon is selling the second-generation Ecobee3 for $187. That’s $63 off the sticker price, as well as being about $13 cheaper than at other retailers. The Ecobee3 can monitor multiple rooms in a home—though it comes with one wireless sensor, it can support up to 32. Its premise is that it dynamically adjusts the temperature based on which rooms are occupied and what their conditions are. (As long as you have a sensor to relay to the main unit such information, of course.) The company claims an average of 23% savings on your heating and cooling costs per year. As you might expect from a smart thermostat, the Ecobee3 offers control of the system through an app (Android and iOS) in addition to its LCD touchscreen. It also supports Alexa, Apple HomeKit, IFTTT, and other services. For power, the Ecobee3 relies on hard-wiring, and comes with a Power Extender Kit for homes that don’t have a C-wire available. The primary sacrifice you’ll make by opting for an Ecobee3 over an Ecobee4 is the lack of built-in Alexa functionality. While the Ecobee3 can integrate with an Alexa device like the Echo, it lacks the far-field voice microphones and speaker of the Ecobee4 that allow direct conversation with the thermostat. If you don’t need that feature (say, for privacy concerns), then you can save yourself a nice bit of cash.